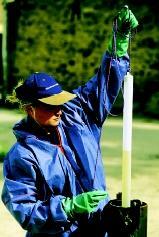 Water sampling provides critical information for environmental scientists. Results can indicate not only the chemical and biological conditions of natural waters, but also the presence of pollutants that may pose environmental or human health concerns. Environmental science as it relates to water may be broadly defined as the study of how fresh-water and marine-water environments are faring in the face of a swelling human population, degradation by pollution and the disturbance of natural habitats, problems with either excess or insufficient water, and threats to the sustainability of living and nonliving resources. Environmental science is interdisciplinary, including aspects of ecology, environmental management, biology, chemistry, microbiology, zoology, geology, soil science, statistics, and land-use planning. The environmental scientist often will work as a part of a team of scientists, engineers, and planners in an effort to better understand how a specific environment works so that its compatibility with changing land use can be evaluated. Environmental engineering, as it applies to water, is broadly concerned with the design of structures or systems that help protect or solve a problem with water. Two of many career paths in environmental engineering are pollution control and remediation . An environmental engineer may be involved with s urface water, groundwater, and soil water. Engineered strategies encompass physical, biological, and chemical principles. Hence, training in environmental engineering requires a firm grounding in basic science as well as engineering specialties. As with the environmental scientist, the environmental engineer will need to consult and coordinate with others, particularly scientists, in order to build a structure that is compatible with the environment. Government agencies such as local, state, and federal environmental protection agencies employ environmental scientists and engineers, where they often deal with regulatory issues. Consulting firms hire scientists and engineers to help their clients meet regulatory criteria. Similarly, utilities, pharmaceutical companies, manufacturing companies, and many other businesses need specialists and engineers to meet environmental protection requirements. Universities and private research institutes conduct research in an array of environmental science subspecialties. International opportunities exist as both developed and developing nations deal with water quality and water quantity concerns. Doyle, Kevin, Tanya Stubbs, and Sam Heizen. The Complete Guide to Environmental Careers in the Twenty-First Century. Washington, D.C.: Island Press, 1998. Masters, Gilbert M. Introduction to Environmental Engineering and Science, 2nd ed. Upper Saddle River, NJ: Prentice Hall, 1998. Information about Environmental Engineering Careers. American Academy of Environmental Engineers. <http:www.enviro-engrs.org/newlook/careers.htm> . Occupational Outlook Handbook: Environmental Scientists and Geoscientists. U.S. Department of Labor, Bureau of Labor Statistics. <http://www.bls.gov/oco/ocos050.htm> .